Have you selected your word for the year yet? I started doing this three years ago and I love this now ritual. When I chose my first word for the year, I didn’t know it was a thing. It just felt so good to come up with a special overarching word for myself that fit how I wanted to feel in the brand year year. I found I kept repeating the process every January. This post contains affiliate links, which means I may receive a small commission, at no extra cost to you, if you make a purchase using this link. What is a Word for the Year? It’s a word you choose as a theme for the year. Is there a feeling or state you want to move toward? Happy, Renewed, Committed, Inspired? Is there a feeling or state you want to move away from? Disappointment, Fear, Grief, Complacency? Now that I think of it, this reminds me of a chapter in my GOAT self-help book, Awaken the Giant Within, by Tony Robbins. I discovered this book decades after it was written and it is one of those things that for me has withstood the test of time. For some reason, I found Chapter 15 (Life Values) of the book overwhelming. Tony suggests you write out a list of your Top 10 Moving-Toward Values and your Top 10 Moving-Away-From Values – and to use this list to clarify the priorities of your life and therefore, shape your destiny. He suggests you “condition yourself to use them as your new compass” in life. I don’t think I really found an easy, fun way to do this (keep the desired emotional states top of mind) until I started choosing a word for the year. Maybe I had to take it one word at a time. Around Christmas-time, I felt inspired to choose my “one word” a bit early. I did a little research to see what other women were picking. After doing an in-depth survey of the responses in my Facebook and Instagram communities, I asked my close people IRL and also brainstormed some of my own fave words such as “whitespace.” I came up with a list of 181 word suggestions that I believe is a good representation of what female bloggers and entrepreneurs, mommy-bloggers-to be, crafters, creatives and students are focusing on in 2019. I spent some quality time researching and brainstorming words of the year, so I decided to make this my first blog post of my new blog so I could share this information with you. What do you think was the most popular word chosen? What if you can’t pick just one word? Ok, if you (like me) can’t just pick just one word, you can pull one word (from your top picks) and add a correlating phrase, use two or three words or you can break your list down to 12 words and create your own little Word for the Month 2019 Calendar (more about that later). Or you can choose a a simple phrase alone that captures the vibe you are craving. Grace (Grace not Perfection) – Variation 2 – – – This is mine! What if you just can’t choose any Word for the Year? Just skip it. It shouldn’t be frustrating or stressful to choose your word. It should feel exciting and make you happy. Maybe it’s not for you . . . a this time. Or now that you’ve opened up to it, a special word might come to you later in the year. Have you chosen the perfect word for you for 2019? Celebrate! 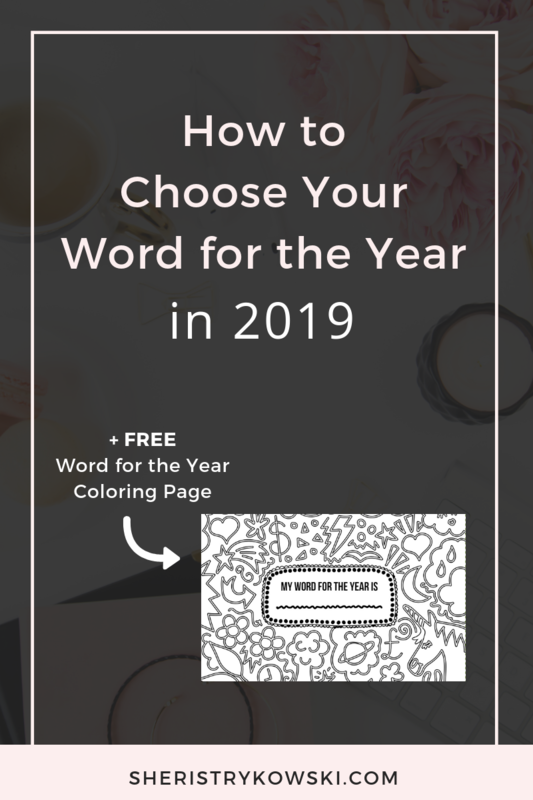 Want a free Word for the Year wall hanging that is also a coloring page?